To me, the ideal summer meal comes together relatively quickly without turning on the oven. These chicken lettuce wraps are just that; the most labor-intensive part is in chopping all the fresh produce, and then it cooks up in less than 15 minutes on the stovetop. It’s a wonderful family dinner or summer party finger food. I love the vibrant colors and flavors here, especially the kick of ginger and sweet hoisin sauce and the subtle notes of orange. Some lightly sautéed bell pepper and crushed peanuts give it some lovely crunch. I use romaine lettuce as I think it stands up better than traditional iceberg to hold all that delicious filling inside and to me has more flavor. Make these fresh & vibrant chicken lettuce wraps and you won’t ever crave the Chinese restaurant ones again! Prep the fresh ingredients and set aside in separate prep bowls as you go: Wash mushrooms, remove their stems, halve and slice the tops. Mince the garlic, grate the ginger, dice the 1/2 bell pepper, shred the carrot, dice the scallions and zest the orange (then slice and set aside wedges for garnish). Crush the unsalted peanuts in a mortar & pestle or use a knife to chop and crush; wash & chop the chives. Cut the chicken into the smallest pieces you can (no larger than 1/2-cm. cubes) and sprinkle lightly with salt & pepper (note: if you are using salted peanuts, go easy on the salt here or omit). Heat oil in a large skillet and cook the chicken until it is no longer translucent, 4 to 5 minutes, stirring occasionally. When chicken is no longer translucent (but not fully cooked through yet), add the mushroom slices, garlic, ginger, bell pepper, carrot and scallions and let cook through, about 2 to 3 minutes, stirring occasionally (cover to hasten the cooking time). Add the orange zest, hoisin sauce, and sambal oelek and stir; taste and adjust seasonings if desired. Turn the heat off and add the peanuts and chives, mix once more and give it a final taste. Adjust seasonings as necessary, then transfer filling to a large serving bowl. To serve, scoop a few spoonfuls of the filling into the romaine leaves, or let guests assemble their own. Set out orange wedges and extra chives for garnish if desired; I found a little spritz of orange over the top brings out the vibrant flavors. You might also like to serve it with steamed white sticky rice; my little one enjoyed filling her wraps mostly with rice and a little filling. Enjoy! Thanks! I think we like a lot of the same flavors, I think you’d like these wraps with the ginger & orange. I have everything I need for this, looks wonderful! I love lettuce wraps of any kind, especially in the summers! Delicious looking recipe! Thanks, Ngan! Lettuce wraps are so nice in the summer, aren’t they? Fresh and light and these ones are so easy. Looks like the perfect summer dinner, Laura. It sounds perfectly flavored and love the mix of textures, too…a party for the taste buds! Me too – I find I can enjoy the tasty filling without feeling too guilty, as it is wrapped in a healthful exterior. The orange really brightens it too:) Thanks, Fae! I hope you got as many helpings as you wanted, Julianna! I will whip up a new batch for you anytime you need 🙂 Thanks so much, and thanks for always making FF fun, it’s great to see you here each week! I wouldn’t miss out on it! So many cool chefs at one party! Ah…. nice & healthy, pretty colors, and perfect for summer- I LOVE IT! Thanks for sharing this! Thanks, Stephanie, and so glad you stopped by! Looks fantastic. Thanks for bringing it to the FF party! Thanks, and good to see you at FF! My pleasure, I hope you like it! 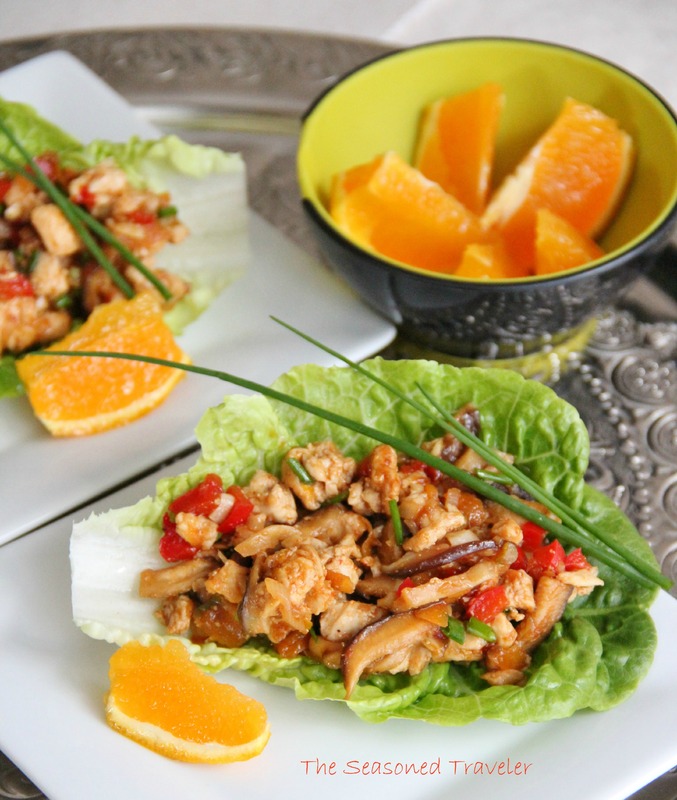 Gorgeous photos of a delicious looking dish – I love lettuce wraps especially in the summer. Thanks for sharing this with us and Happy Fiesta Friday to you ! Thank you, Selma! I love lettuce wraps in the summer too, so fresh and tasty! 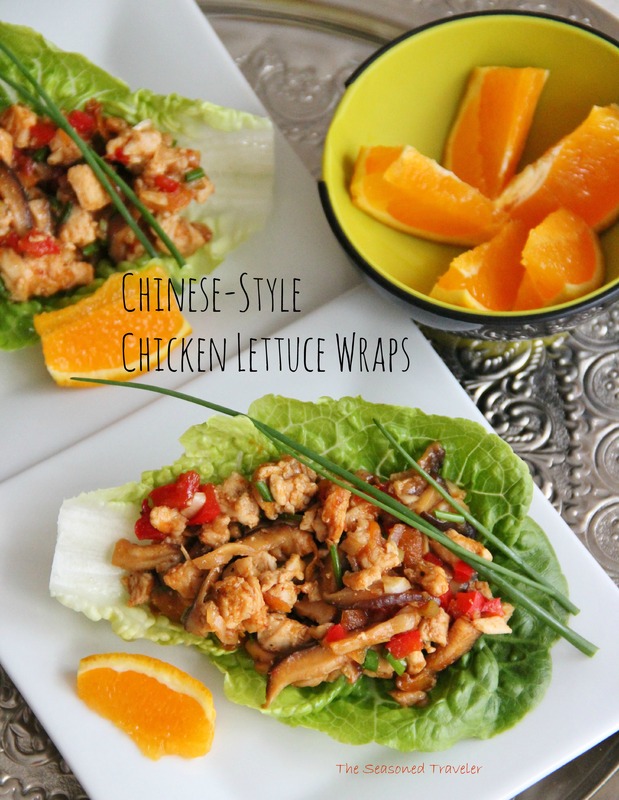 Gorgeous looking lettuce wraps, and your pictures are just awesome too. I don’t even eat chicken and you made me crave it with these beautiful pictures. Seriously stunning. I also love the use of peanuts for some crunch (who doesn’t like a little texture in a dish) and some orange for a sweet summery zest. Beautiful pictures, beautiful recipe. Thanks! Yes, the peanuts were almost an afterthought but I was happy to have that extra crunch, and extra zesty flavor from the orange. So happy you like it! I bet you could find a chicken alternative – maybe tofu, or a grain? That sounds wonderful, I hope you have a wonderful meal with your girls. Thanks so much for your kind words! Thanks, I am on an Asian kick lately too, isn’t it so nice to have all those enticing Asian staples so accessible again? Enjoy! Yes it is! I made spring onion pancakes tonight- heaven!! Wow! These look delicious and so pretty! I’m giving this a try! They look delish!